I need to make a confession. I’ve been meaning to say something about this for some time, devote a post to my decision, get all thoughtful, outline my reasons, defend myself. The confession is this: I’ve started eating fish. Or should I say: re-started. A had a stint with fish a couple years back, after nearly twenty years of being a lacto-ovo vegetarian, some of those years mostly vegan. The stint was temporary, but I’ve returned for round two with the sea creatures. The reasons are myriad. Maybe later I’ll write a philosophical post about this. But right now I want to talk about Koba. 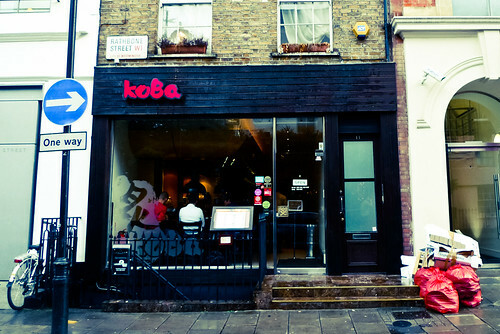 Koba is a Korean restaurant in London’s fashionable Fitzrovia area, adjacent to Soho, and surrounded by trendy pubs which, at 7:30pm on a Tuesday, are found heaving with after-work “punters” in suits and pointy shoes downing pints and being Londoners. I, however, was after kimchi, not Kronenberg, and an evening with a couple Twitter friends and fellow fans of fermented foods: @VerityW, @EvidenceMatters and her very charming husband. The meetup was inspired by a conversation about pickles, wherein @VerityW confessed she had never had kimchi. 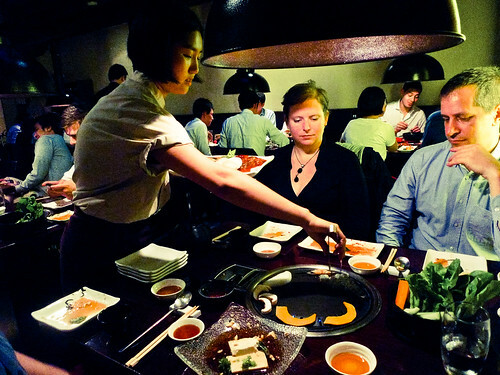 Well, it was clear what we had to do: book a table at Koba, one of the better reviewed Korean restaurants in London and recommended by learned foodie @SabrinaGhaynor. 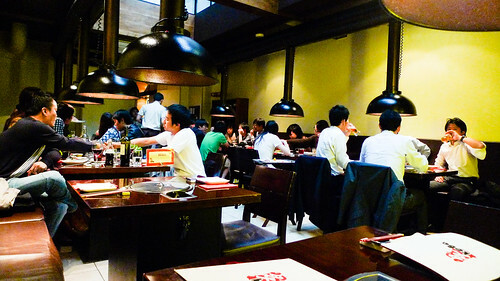 Koba’s interior is slick, stylish and romantically lit. The menu is long. Naturally, we ordered the “assorted kimchi”, a trio of cabbage, cucumber and turnips, much milder than other kimchi I’ve had, and we reckoned a fitting introduction for @VerityW (who loved it). 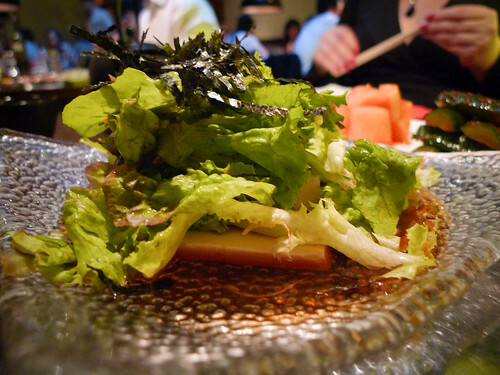 The tofu salad was something I’d like to try making at home: raw silken tofu, sliced into pencil-thick slabs, topped with lettuce, shredded seaweed and a sweet soy sauce. It was very simple, a cool, fresh counterbalance to the tempura-like vegetable and tofu patties that came next, pictured at the top of this post and expertly photographed by @VerityW, with @EvidenceMatters holding the menu. The main event was, of course, the barbecue, a Korean experience that’s only just become available to me now that I’m eating fish (for meat-eaters, it must be a paradise). None of us were entirely sure of the etiquette in this situation, and wished we had watched other people more closely before our server arrived with a plate of assorted seafood – fresh salmon, squid, prawn, baby octopus, mussels and scallops. The food was raw, and she placed it on a hot grill built into the middle of our table. Then she walked away. Were we supposed to finish cooking it ourselves? I’m not sure – when we took charge to flip the salmon and prawns, the server returned, reclaimed the tongs, then finished the flipping for us. As the food finished grilling, we helped ourselves to bits of fish and seafood and ate it with raw vegetables, sweet slaw and a delicate dipping sauce that I couldn’t quite identify. I really enjoyed this. Every thing was incredibly fresh and needed very little adornment. 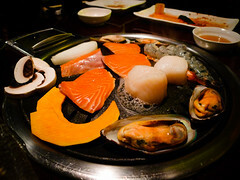 This is my idea of a perfect meal: fish and vegetables, both of exceptional quality, prepared simply. After two hours of excellent food and superb conversation, I felt satisfied, and not overfull. I love food that leaves me feeling good afterwards, albeit a touch garlicky. But I love garlic, too, so it’s all win. 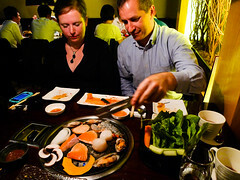 I may not be a vegetarian anymore, but I’m still very much a vegetarian sympathiser, and it’s worth noting that Koba had plenty of options for veggies, including vegetables for the barbecue and the classic Korean bibimbap, another “perfect” meal in my eyes consisting of egg and raw vegetables. The only thing better than the food was the wonderful people I was dining with, lovely folks who share my appreciation for pickles, kimchi, comfortable walking shoes and go bags – you just don’t find that kind of combination everyday. And generous, too: @EvidenceMatters surprised us with a jar each of her homemade strawberry freezer jam. I was barely home five minutes before I opened the jar and had a spoonful (first of many). The jam is excellent – chunky, not too sweet, and full of strawberry goodness. A fitting end to a perfect evening. Thanks gals and guy. 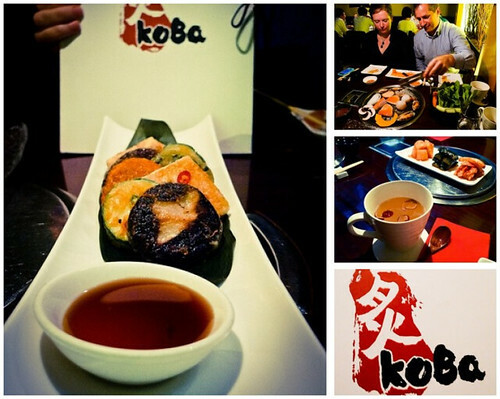 Koba sounds really good–and I dearly miss good Korean food! I like that they have more than just beef for the barbeque too. Most I’ve been to are beef or pork centric. And kudos for just getting “it” out there! I meant to email when you mentioned it ages ago, but then I didn’t. Story of my life lately. It takes courage and I think this post was a beautiful way to go about it. Rock on! We had a very good time, too. On the way home we were trying to remember the incremental grades of ‘go bags’ that some people recommend and I think the ‘baby steps’ one is supposed to pack into an Altoids tin (albeit this seems to vary from a First Aid Kit/medication stash oriented one to something that allows some hunting/trapping & fire-making). Just for the record, we don’t have any such tins – we’re preparedness dilettantes. My friend, Jih Soo used to take me to her favorite Korean restaurant (now closed) and order for me. 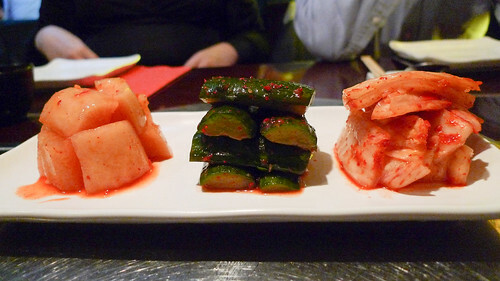 Oh the varieties of kimchee. I have loved it ever since. The flavorful simplicity is a joy to experience and always left me satisfied, intrigued and wanting to return. I brought Steve and he enjoyed it as well. 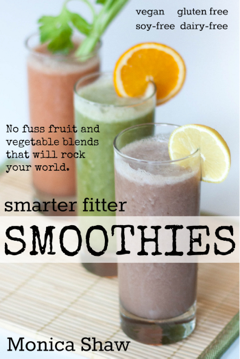 Great job on this article and spreading the word….